Nothing completes a bathroom like a claw foot tub. 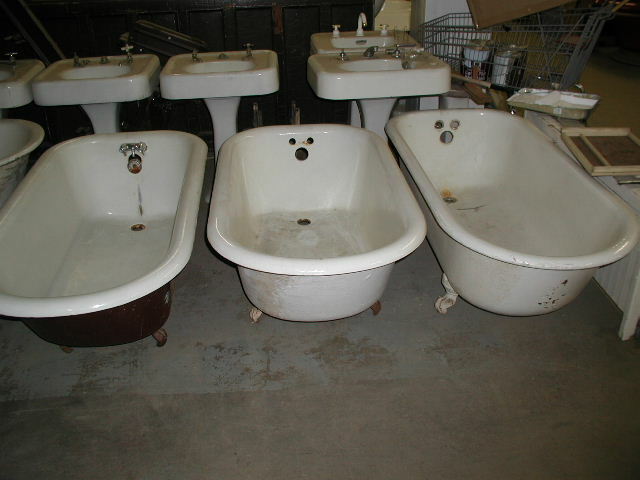 Our claw foot tubs are 100% authentic tubs salvaged from old buildings, not cheap imitations. Our tubs are found in 5 different sizes and come with many different styles of feet. the pricing is determined by the style of feet on the tub, the length of the tub and the condition of the porcelain on the inside of the tub. There are many different companies out there today that specialize in refinishing these old tubs and pricing is so competitive that a refinished tub will still come out less than the price of a new claw foot tub. Please contact us for pricing and availability.